SECTION 1 – This area is referred to as the Stetson Area and it comprises the northwest portion of the City. It generally extends south from 7th Avenue S. to Gulfport Boulevard and east from 64th Street S. to 58th Street S.
SECTION 2 – This area is also known as the Northeast Area. It generally extends north to 7th Avenue, south to Gulfport Boulevard, west to 58th Street and east to 49th Street. 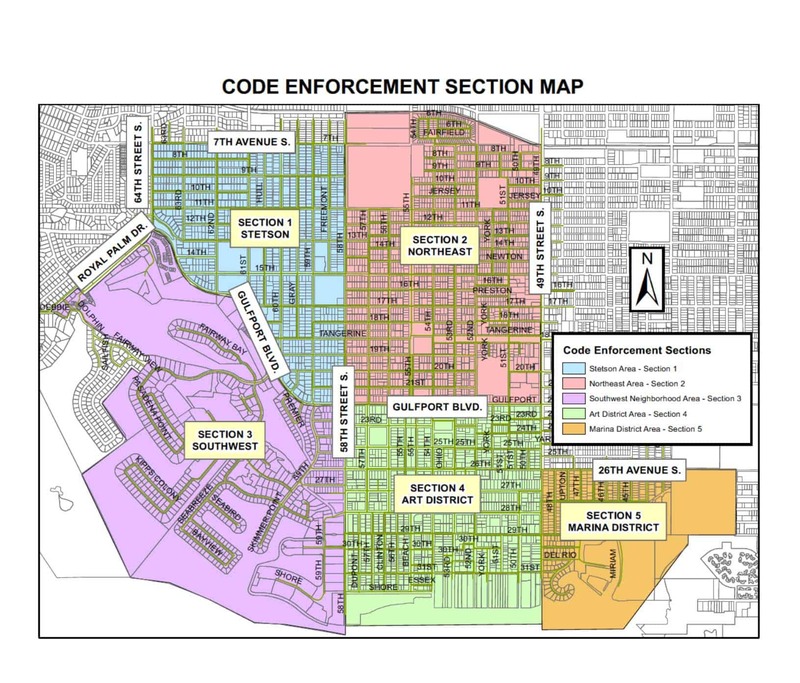 SECTION 3 – This area is called the Southwest Neighborhood Area generally extends south from Gulfport Blvd. to the water and west from 58th Street and 59th Street to the City Limits. SECTION 4 – This area is referred to as the Art District which generally extends south from Gulfport Blvd. to the water and east from 49th Street S. to 58th and 59th Street South. SECTION 5 – This area is also known as the Marina District Area. It comprises the southeast portion of the City and generally extends south from 26th Avenue S. to the water and east from 49th Street S. to the city boundaries. If you wish to call in a complaint, discuss a case, or speak with the inspector please call (727) 893-1063. We do take anonymous complaints, however remember if you leave an anonymous complaint, the inspector can not get back with you to explain what actions the City will be taking to resolve a case. If you happen to get a notice or letter of violation, please do not ignore it. If you cannot take care of the violation immediately, speak with the inspector about setting up a reasonable plan of action to address any violations.